The trainer consist of a complete, fully operational Multi Point EFI system. Original components should be utilized and clearly laid out on a display board that is mounted on an integrated floor stand, made from powder coated electro galvanized steel, mounted onto wheels for mobility. A color coded schematic chart, under a lexon polycarbonate protective screen, of the EFI system and circuit’s, should also be mounted onto the trainer for reference. 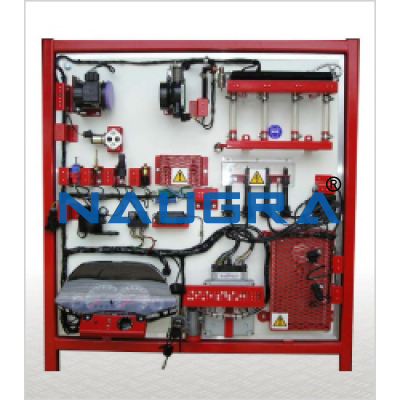 We are leading manufacturers, suppliers & exporters of EFI model. Contact us to get high quality designed EFI model for schools, colleges, universities, research labs, laboratories and various industries. We accept bulk orders for government tenders in all countries around the globe.